As we head into the ninth post of the #RPGaDay meme, it becomes increasingly obvious that “it’s hard to pick just one!” is becoming a theme. Today is “Favorite Dice Set,” but I ultimately decided to show off three different sets that are my favorites. 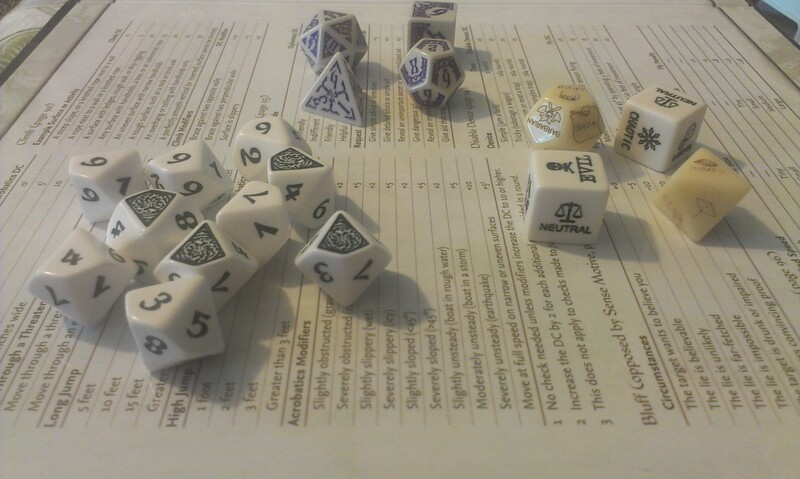 Next are my “random character generator” dice, featuring eight different races and twelve different classes, along with the nine alignments! Oh, that random NPC I didn’t plan on existing, he’s a neutral evil human monk, apparently! My only complaint is that some of the dye didn’t survive the tumbler as well, so some faces are hard to read. What is your favorite dice set?